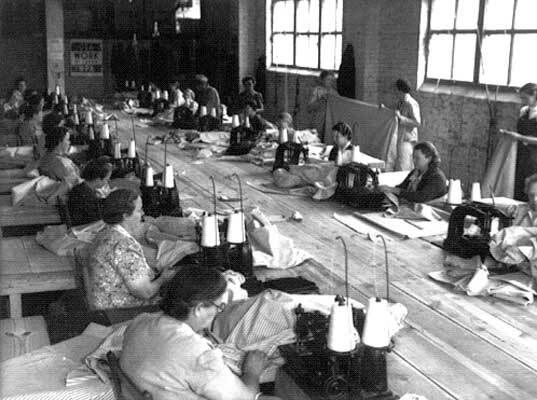 In a mattress-making project of the Works Progress Administration — a federal New Deal program of the 1930s — Waco workers in this room are cutting the bat rolls for different size mattresses. Before the Great Depression slammed into Waco following the stock market crash of 1929, the city had been one on the move. By 1930, Waco had grown to 53,848 souls, but hard times undercut the city’s momentum. As prices for cotton and other agricultural products fell and farmers subsequently reduced their spending, businesses in Waco were forced to lay off employees. Ultimately, many shops closed their doors, throwing hundreds out of work. The Texas Cotton Palace Exposition, long a shimmering symbol of the city’s prosperity, even closed its doors. According to regional historians, President Franklin Delano Roosevelt’s New Deal programs helped to create employment opportunities and infused money into the city. The Works Progress Administration — later known as the Work Projects Administration — for example, established an office in the city and paid for the construction of University High School and other local projects. During the Great Depression, Waco also became a distribution center for the government’s surplus commodities program. The WPA also put people to work collecting oral histories from friends and strangers with great stories to share. The Folklore Project of the WPA Federal Writer’s Project — which ran from 1936 through 1940 — can be accessed online through the Library of Congress. The online archive includes some 2,900 documents representing the work of more than 300 writers from 24 states. Among the Texans interviewed were those old enough to remember slavery and pioneer days in Waco. In the first half of the Depression, evictions uprooted some 60,000 Texas farm families. Driven by necessity, these economic refugees joined a stream of crop-following workers. Rumors of “better pickings” and higher pay caused migrants to flood communities where no work actually existed. In other locales, farmers were begging for “hired hands” to save their crops. The haphazard movement of family labor resulted in conditions that spawned poverty, squalor, health problems and discontent along Texas highways. Tales of starvation and deplorable sanitary conditions in roadside camps shocked the State Employment Service, now the Texas Workforce Commission, into action. The SES encouraged communities to set up camping grounds with running water, toilets and garbage disposal units. Waco and about a dozen other regional centers for migratory labor built these camps — not spectacular lodgings, but a far cry from primitive and crowded mud holes. Waco’s population grew slightly during hard times, and by the eve of World War II, more than 56,000 people called it home.